Fight with swords against AI opponents utilizing three styles of sword combat. In this game, you can advance and retreat and attack with 3 styles of strike, low, mid and high. Start with fencing against 3 opponents. You need 5 hits to win. Then bamboo swords in a samurai format (sports). 2 hits each will win. Then 3 gladiator opponents. One hit to victory. After each phase you can try to fend off arrows with your warrior in bonus rounds. 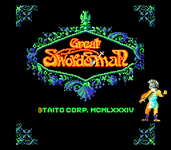 You are a Great Swordsman!! !